Intercultural adventures: Reading road signs in the U.K. and the U.S. | Notes from the U.K. This entry was posted in Driving, Intercultural Mayhem and tagged Americans in Britain, Americans in England, anglophile, Britain, Driving in Britain, humor, language, road signs by Ellen Hawley. Bookmark the permalink. This really made me laugh. Our road signs are unbelievably ostentatious, I agree. I think they are just trying to be polite, but who knows. I’m sure you’re right: It’s politeness. That seems to be the default explanation for everything over here. As I tell my husband, sometimes the effort to be polite counteracts what you are trying to achieve. Wise advice. But not something polite people can actually hear, I suspect. If that person values efficiency and logic too, there is hope. Ah yes … road signs. Well I do like something good to read while I’m driving. The plots are a bit thin. I mean … STOP. That’s a very abrupt ending, but quite punchy. I quite like ROAD CLOSED (don’t even go there!). I hate advisory road signs. One near us reads 20 IS PLENTY. Someone wrote underneath … yeah, but 50 is nifty. Ah, the plots of road signs. So disappointing. Especially after you’ve pulled over to read them. Which may help explain why it remained unrented. Very funny post. You made me laugh. Great. Today’s goal is accomplished, then. In Connecticut, the first sign that goes up is a legal explanation that explains the State’s limited liability for damage while you are traveling over a road that is technically unfit for travel due to construction. I guess that’s very American: Before you do anything else, worry about lawsuits. The signs on the underground are novellas. At least then you are walking and can read them. I think efficiency is favorable over manners when it comes to road signs. I will accept some abrupt rudeness if it means I stand a chance of comprehending the message. The road sign that always amused me most was one on the side of Loch Lomond reminding drivers to drive in the left. If you’ve made it that far from Glasgow airport in your rental car and are still in one piece then I think it’s safe to say you’ve figured that out before that juncture. Good point. I just stumbled on a video taken (as far as I can figure out) from inside a rental car in New Zealand. A fair-size sticker on the windshield says “stay left.” Not a bad place to put it. I admit I prefer bluntness – I am just horrible at reading subtext, reading between the lines, reading body language, etc. In other words, everything that the average female is supposed to be proficient in. Especially at work! Him: What do you think about X procedure? Me: I’m not going to do that because Y. Him: Well but do you want to talk about X? What do you think about it? Me: Well, like i mentioned, I don’t think it makes sense here because Y. Him: Well, I think the partner might be expecting to see X. Me: No problem – I’ll talk to him and explain Y to him. The poor guy actually had to work with me a LOT and looking back I feel bad for him. He couldn’t bring himself to just say, “Do X. That’s an order” or the equivalent. If he had, I would have just done it. But because the conversation seemed geared around what I thought, I just did what I thought and didn’t think anything of it. I should probably work on that tendency before visiting England. So thank you for the education! Yeah, subtlety usually leaves me wondering what happened too. In Minnesota, Wild Thing sometimes had to translate for me when people were being indirect. On the other hand, if your colleague couldn’t bring himself to say “just do it” and it actually mattered that X not get done, maybe it was for the best. I work in a job that with very few exceptions, professional judgment (as long as it’s documented properly!) remains supreme. In that case X wouldn’t have hurt anything, but it would have cost us time we didn’t need to spend. The guy was a sweetheart but he just could not be direct to save his life! It can’t be easy to live that way. Athena, I think it is both, depending on where you live. If you are a direct communicator and live among direct communicators, there are certain places that will drive you crazy. I came from a family of indirect communicators while living in Pennsylvania, so I can function in either environment. Ellen is right about Minnesota, and I am sure she has more to say about “Minnesota nice”. There is a lot of that in the Northwest suburbs of Chicago too, which leaves you reading between the lines a lot when you just want people to say what they are thinking directly. Yes! This is me! When I was running a dog rescue organisation, I would say to a volunteer, “Can you do x?” and if they said, “Well, the problem is y” and I’d then solve the problem … and I could never figure out why they then went off and complained that it was “impossible to say no” to me. No one here EVER says no! Sigh. I’d much rather run up against the solid wall of a no than get lost in all the complexities people invent instead. When I drove cab in Minneapolis, I was convinced all that construction was done by the Department of Cab Driver Harassment. It drove (no pun intended) me nuts. Minneapolis is the worst. I worked downtown in the 1990’s and the city made no effort to coordinate street work. Between the city street crews, power company, phone company, sewer, water and cable, every street in downtown was blocked somewhere, all summer. You could not drive from one end of town to the other without detours. These days, I live in a town that boasts proudly of its single stop sign. Yup. One outfit would tear it up and put it all back together, then someone else would come along and do it all over again. The same joke is made in Boston and Chicago. You know that these sort of jokes always have strong elements of truth in them. My merging skills are honed at this time of year just from pothole repair alone. Thanks for making me laugh this afternoon. Then there’s the directional signage . . . Several years ago, my husband and I spent a wonderful week or so touring Cornwall. I truly don’t know which of us had the more difficult task–him, doing all the driving, trying to find the proper gear with his left hand when entering and exiting roundabouts, or me–trying to read the listed names of towns as we flashed past the signs in the hope of finding a direct route to our destination. Needless to say, we found ourselves “detouring” quite often, resulting in the opportunity to visit sites and areas not on our intended itinerary. But I’m guessing this could be a topic for a whole ‘nuther discussion. Right you are. I’ve got to write about that. I didn’t think to say this, but some of the directional signs here are written on the pavement, so if traffic’s backed up you can’t read them. Not helpful. I’m wondering whatever happened to the Traffic Cones Helpline – when we could report rows of cones blocking the roads BUT NO WORK HAPPENING! A traffic cones helpline? Do traffic cones get depressed? Suicidal? If you’re right about the Highways Agency being outsourced, they’d have all the more reason to be. I liked the helpline so much better. I was ready to volunteer. I was going to mention the Cones Hotline, if someone didn’t beat me to it. It was the highlight of the Major Government. It gave Paul Merton punchlines for eons though. Some governments make it so easy to satirize them that it’s almost embarrassing. Thoughts on culture shock: I had lived here two years before it finally dawned on me that when smiling women remarked, “You’re very direct, aren’t you?” they weren’t actually complimenting me. Y’know what? You’re right about a large part of the country. I’m from New York, and I am blunt. Or tactless. Take your pick. It would take me longer than two years to figure out that those smiling women weren’t complimenting me. More like twenty. In Minnesota, though? God, did I ever not fit in. The phrase people use there is Minnesota nice, which is basically a refusal to say anything directly. Garrison Keillor had a riff about someone working on a car’s gas tank with a welding torch and the correct Minnesota response being something like, “Y’know, most fellas wouldn’t want to do that.” Because Wild Thing’s a southerner, she grew up with that kind of indirectness and occasionally would translate for me. So apparently the British stereotype of Americans has merged with my own background and colonized my mind, shoving aside the contradictory reality. Thanks for calling me back to earth. Here in Indiana the roads are never done, the roads are always closed, and with any luck there are corresponding DETOUR signs that lead us out of it properly. “Orange Barrels” is a popular song here. Oh, but once the pavement is laid…soooo niiiiice! I’ll have to look up “Orange Barrels.” I don’t know it. I saw a sign in Swaziland last week which said “Road Failure”. In fact the edge of the road had been washed away, but a great sign. Hi Ellen, I totally enjoyed reading your post. You’re right you really can get an impression of the culture just by reading those road signs. In Switzerland they are extremely short, almost to the extent to not give any more information than “Roadwork” :) Have a nice day! Thanks for adding that to the discussion. 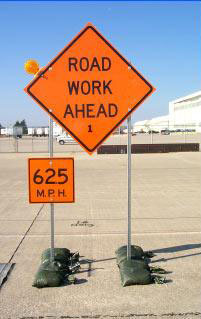 I’m with you–“Roadwork” is a bit short. I’m pretty sure I could read it at 60 mph, but I still wouldn’t know much. The ones that crack me up out here are the “Your Tax Dollars at Work” signs. (Not part of the construction or repair warnings.) I suspect that some politician thought it would be a great idea to brag about what he’s doing for us, yet I tend to cuss the guy for holding me up or for how slow the work is going. It doesn’t seem to provide the warm, fuzzy feelings he may have intended. Not a great strategy, I agree. I’m not anti-tax–I don’t like paying them anymore than anyone else does, but I do consider them a necessary evil–but even so, the phrase your tax dollars isn’t calculated to put anyone in the best possible mood. I so love this AND I want pictures. So next time you two go motoring, take a camera. No promises. I thought about going sign-hunting for this post but good sense got the better of me. The signs tend to be set up where someone’s likely to plow into you if you pull over to take a picture. So I took the coward’s way out and used the closest thing I could find on the internet, which turned out to be from the U.S. All told, living through it seemed like a better idea than getting the perfect picture. That has the ring of truth about it. When I first drove in the US I was always looking for signs in the wrong place – by the side of the road. In the US I learned, they are typically overhead. That took some getting used to. I know what that’s like. When my partner and I started driving in the U.K., one of the passenger’s jobs was to yell “Yield!” whenever she saw those broken lines across the road, because we were used to looking for a sign beside the road. Pingback: British stereotypes of Americans–and my own | Notes from the U.K.
Hahaha. You need to post a photo of a UK road sign! Yeah, someone else suggested that, and I did want to. The problem is the road closure signs hang out in places where I’d stand a good chance of being road kill if I stopped to take a picture, so I took the coward’s / smart person’s way out and grabbed the only road closure sign I could find on the internet–which happened to be a test sign from the U.S.
62.5 mph? Damn, that’s specific. It reminds me of a comment I saw in the newspaper, ages ago. A judge was marveling at the way drivers defended themselves against speeding tickets: “I was only driving 27 miles an hour, your honor.” And who, he asked, actually knows that when they’re driving?